On Thursday the 19th of May at 7.30pm there will be a talk entitled “Getting on track to prevent waste before new pay by weight bin charges are introduced this July” at Greystones Library. Jim Callery of Wicklow County Council will talk about the how the new pay by weight charges will impact on how we manage our waste and how a focus on prevention will help us to produce less waste and lower our costs. 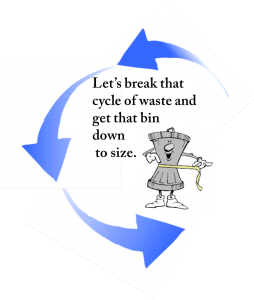 Preventing waste saves on the cost of disposal but the bigger saving comes when we keep our purchasing costs down too. Prevention is good for the environment but also good for our pocket.